Submitted by Jeff Buster on Wed, 08/03/2011 - 22:00. Towing a trailer is very easy,,,just push on the gas and you can drive just like there was no trailer hooked to your behind. Until there is an emergency or situation which demands rapid response. Then you are out of control like the three lucky people in the image above. You will notice that the front left hand tire on the Toyota pulling the trailer is blown. But there is also damage to the front left headlight and nose of the Toyota. Looking back at the jackknifed Toyota-trailer combo I saw that the right hand tire of the trailer was also blown off the rim. Then a 1/4 mile down the road a single axel box truck had stopped - maybe that truck also had been involved in the event. You can see the skid marks on the pavement - the Toyota and the trailer were traveling sideways for a distance before they stopped where they are in the image. This doesn't explain the damage to the front right hand corner of the Toyota however. Maybe the right hand tire of the trailer blew out on the hot day (and at the 65mph the Toyota was pulling it), and this threw the Toyota to the left while the box truck was passing (causing the Toyota to hit the box truck, blow out the front left hand tire of the Toyota, and cause the damage to the front left corner of the Toyota?) and then the combination of Toyota and trailer went into a very lucky sideways skid without overturning or breaking free from one another. I didn't see the accident, but I came upon it within minutes of it happening. 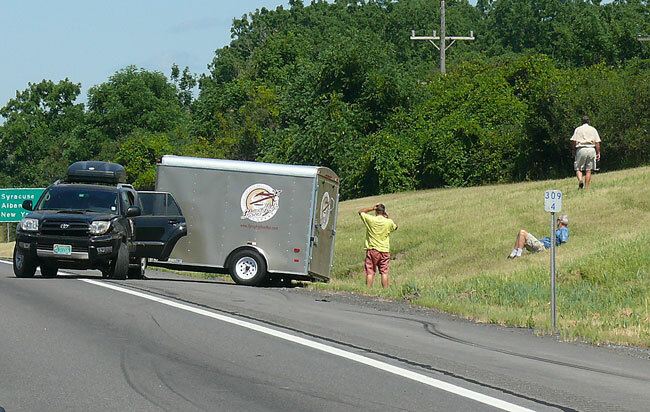 If you have ever had a trailer emergency and been pushed around out of control, you know that the wise move is to not pull a trailer over 55 MPH. Make certain the trailer is loaded with at least 10% of the trailer's gross weight on the trailer hitch (so the hitch is not light and lifting up the back of the pulling vehicle - e.g. if the weight of trailer and plus the load on the trailer is 3,000lbs - this is the Gross Vehicle Weight or GVW of the trailer - aprox 1,800 lbs must be forward of the center of a single axel trailer and this arrangment will put about 300 lbs on the hitch ball.) Make certain the tires on the trailer are sound and are properly inflated - in hot weather this means you may need to let air out of the trailer tires after they are tested running hot. Tire advice it true for pulling vehicle also. Note: as of 8.4.11 a conscientious discussion of this article is taking place over on The Farmall Cub blog. A number of the comments on the Farmall Cub site have brought to my attention that portions of what I have written may be miss-understood or are in debate. I intend to continue the discussion here while paying attention to the Farmall Cub discussion in order to arrive at the clearest description of good trailer practices. Thanks to those commentors over on the Farmall Cub blog for their constructive comments. I'm sure it is fair to say that everyone's objective is to keep everyone safe - trailer pullers and everyone else on the road - and avoid damage to equipment - and of course - damage to our pride! If you have had an educational trailer pulling emergency - by all means let's hear it in a comment or post here on Realneo! And by all means, KEEP ON TRUCKIN'. Since the discussion on the Farmall Cub site has spured me on to do more research on trailer standards and safety, I came across the Sherline Products web site. Sherline produces a small hydraulic scale to measure the trailer tongue jack or trailer hitch weight but their web site discusses all aspects of trailer towing and safety, including the passing truck wind pressure issue which may have played a part in the accident in the image above. I recommend reading the Sherline site for it's wisdom. Joe Martin, the owner of Sherline, has been interested in trailer tongue weight and trailer safety since 1974. NOTE: Forensic reporting has "Sherlock" components to it...trying to report facts when you were not there to see the facts. This type of projection-reporting is healthy though, because with practice one can actually get better at the task. For example, when the hydro facility in Russia was wiped out a few years back, I did a similar forensic analysis which you can review here on Realneo. What this community (and the country) needs next is a forensic analysis of cases like the demolition of Frank Giglio's house - to try to answer the question: what went wrong with the public employees who we pay to work for the community? Forensic analysis of that failure coming soon. Submitted by lmcshane on Mon, 08/08/2011 - 08:31. I agree Jeff- a lot of folks saw the evolution with the creation of CDCs, Housing Court and the City Land Bank. Chris Warren was one of the first executive directors at Tremont West Development Corporation. Gus Frangos held the Cleveland City Council seat now held by Joe Cimperman. Jim Rokakis held the Old Brooklyn-Brooklyn Centre ward seat. They both floated a "Greektown" concept in Tremont while Emily Lipovan was the director. Gus Frangos crafted the legislation for the City of Cleveland Land Bank. Jim Rokakis crafted the legislation that created Housing Court. Submitted by ANGELnWard14 on Tue, 08/09/2011 - 01:18. Submitted by lloydrad on Tue, 03/27/2012 - 07:16.